WhiteCloud Software Ltd. announced the release of version 4.9 of EAComposer. An innovative and easy-to-use enterprise architecture tool. Use it to manage your IT landscape and technology portfolio. Delivered as a pure SaaS product: cloud hosted with a subscription based license model. This released delivered the ability to create tasks inside EAComposer, link these to sections or specific repository items and assign to other users. - Central tasks management: A single Task panel is added, which can be accessed from the dropdown in the top-right of your screen. Here you will see all tasks, their status (e.g. completed, in-progress etc.) and other tasks details. You can also create new tasks and (re)assign or update tasks. 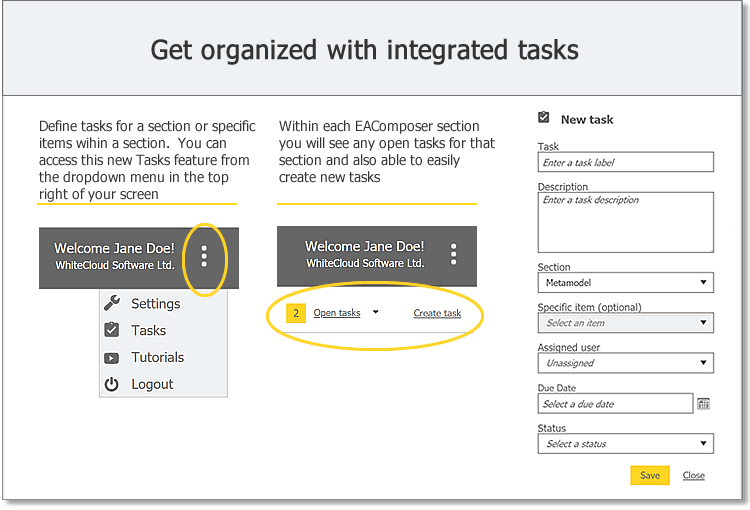 - Integrated with the different EAComposer sections: Within each EAComposer section we added task integration. You will see how many open tasks exist for the section (or on a specific item within a section). You can also easily create new tasks and update open tasks. - Email notifications: All users within the account will receive email updates for newly created tasks, completed tasks and tasks assigned to them.